(USA) – Juniper Design Studio reveal five new additions to its lighting product line. The line includes new additions: THIN Vertical Suspension, THIN Primaries Octagon, THIN Multiples Vertical Suspension, Rail Outdoor Lighting System, and Axis X Vertical Suspension. The THIN Vertical Suspension is characterised by a single line and can be a single unit or clustered to display dazzling installations of warm light. The THIN Primaries Octagon takes the form of an eight-sided shape, is Juniper’s largest pendant to date, and can be expanded, stacked, or clustered to fit architectural specifications. 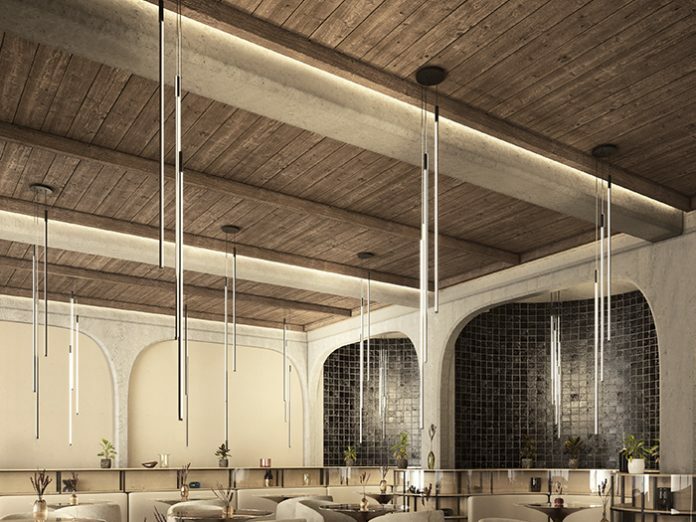 The THIN Multiples Vertical Suspension has a slender profile that projects a minimalist aesthetic, impressive LED lighting capabilities, and offers fully rotatable, magnetically connecting LED light segments with customisable options. The Rail Outdoor Lighting System borrows features from Juniper’s signature THIN System including the ability to extend linear configurations to custom lengths and rotate light segments independently. The piece uniquely offers a water-resistant frame and efficient light output. The Axis X Vertical Suspension is composed of four angle extrusions that, when combined, form a symmetrical cross with four channels of light. The linear solid bronze or wood body is suspended from a single mounting point, creating a long and elegant fixture.